Hi friends! I hope you are kicking off your week well. I had a great couple days with a couple of SUPER crafty girls and it's been absolutely amazing! I went in for blood tests for today and we'll see what comes of that. Ok, so over the last couple days I've spent some time with some TALENTED ladies that I met via the GCD Studios Blog who are actually local. It makes me so happy that I have friends to craft with who really understand the kind of crafting I do. It's pretty exciting. :) I figured that I would show a GCD card in the spirit of this. 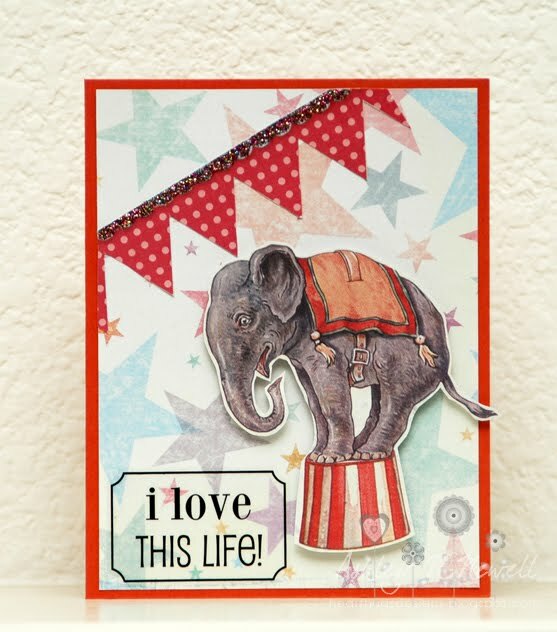 I decided to fussy cut this elephant from the paper and the banner as well. Then I added a SRM sticker and some Stickles. Hope your blood tests come out okay or if not, they are able to determine what's going on with you. That is so fantastic that you were able to find a group of crafty friends...love the card! I hope everything is better now! I still need a group of crafting buddies who share the same intense passion for creativity like me! Why can't you live closer?? ?